Kirsten’s Danish Bakery in Burr Ridge, Illinois (a Chicago suburb) is highly recommended by various Scandinavian organizations as having some of the finest authentic Danish bakery products in the country, including its Award-Winning Kringles. Since 1989 upon moving to the Chicago area from Los Angeles, Kirsten Jepsen’s business has evolved into one of the best full-line bakeries in Illinois with a customer base throughout the Chicago metropolitan area. Kirsten’s Danish Bakery is also known for delicious cakes and superior cake decorating. Kirsten’s Danish Bakery is conveniently located at 94 Burr Ridge Parkway, Burr Ridge, IL 60527 off I-55, south of I-294 at the County Line Rd. exits in the County Line Square shopping center. 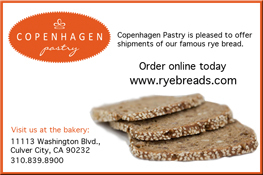 For more information, please phone (630) 655-2066 or visit www.kirstensdanishbakery.com. The bakery hours are Monday through Friday 6:00am – 5:30pm and Saturday 6:00am – 4:00pm. Kirsten’s Danish Bakery also ships anywhere in the USA via UPS.